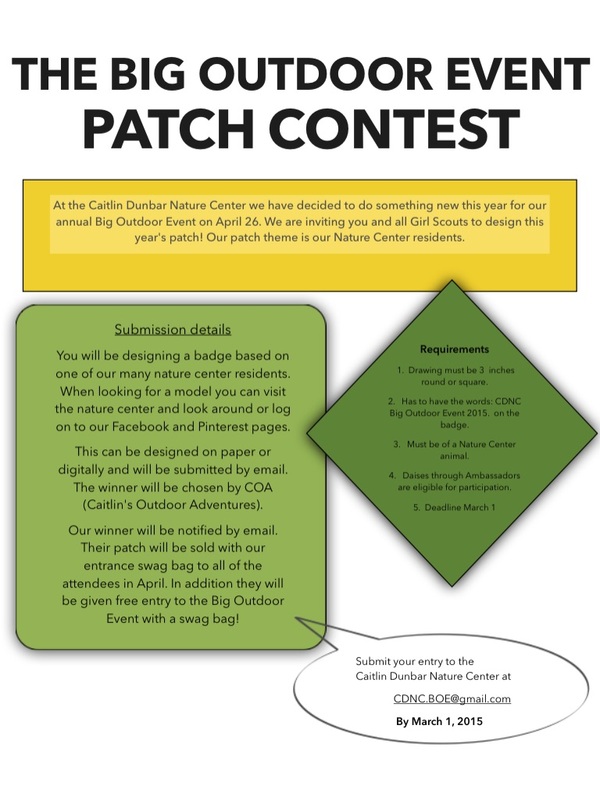 This year the Caitlin Dunbar Nature Center is inviting YOU to design the patch for the annual Big Outdoors Event! The theme is CDNC residents. Choose one (or more) of the wonderful animals that call the CDNC home and design the patch with them in mind. Patches can be designed on paper or digitally. Paper designs can be scanned or or photographed for submission. To submit, send your design to CDNC.BOE@gmail.com. Designs will be judged by the girls of Caitlin’s Outdoor Adventures and the winner will be notified by email. The winning patch will be available for purchase with the swag bags on the day of the event. In addition, the winner will get free admission and a swag bag. Girl Scout Daisies through Ambassadors are eligible to participate. The deadline for submission is March 1. Click here for official rules and requirements. Check out the CDNC’s Facebook page for inspiration!